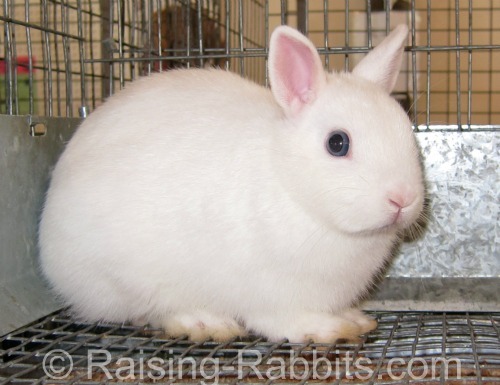 Selective breeding will help you enhance your rabbit herd. Plus it is why there are such huge differences between the many domestic rabbit breeds today. Here is how it works. Over the last 200 years, people have made strategic rabbit breeding choices. They have sussed out the genetic traits that best served their purposes for their rabbits within their family, community and society. 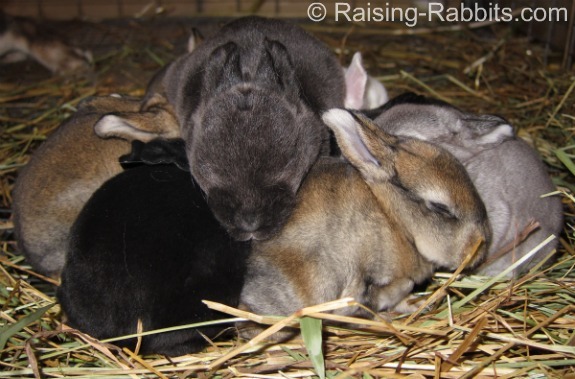 Breeding selectively applies to color, size, body type, fur or fiber quality, growth rate, mothering abilities, and many other traits possessed by the rabbit. The rabbit's genetic code contains duplicates of every trait and is in most cases very complex. In addition to the actions of the genome, modifying factors contribute to or adjust the various genetic signals. The wise use of selective breeding concentrates the desirable genetic information in the offspring and lets fall to the wayside the genes that fail to further the particular breeding program or rabbit breed. Perhaps you yourself are even using selective breeding whether or not you call it by this name. Suppose you wish to raise tiny rabbits. If so, you aren’t the first person with this idea. Breeders have been selectively breeding for “small” since the 1800’s. 150 years ago, when the idea that you could keep rabbits as pets was first dawning upon people’s imaginations, the “common white hutch rabbit” was spread throughout England. They had a wide weight spread, usually weighing between 4 to 8 pounds. By the mid-1800’s, the breed had gained the name of “Polish,” perhaps to make it sound more exotic. By the early 1900’s, after continuously breeding together the smaller individuals of the breed, Polish rabbits regularly weighed just 2.5 - 3 pounds. At the same time, its type was being developed from a hug-the-table pose to an upright, or arched, type, very similar to the Belgian Hare type which was very popular in those days. In the UK, the Polish rabbit now weighs no more than 2.5 pounds. In the USA, Britannia Petites are the same rabbit, different in name only. The USA also has a breed called the Polish, which may weigh up to 3.5 pounds and has a compact type rather than arched. Polish in the USA show evidence of the use of other breeds such as the Beveren, Havana and Netherland Dwarf, used in order to acquire different color genetics. It took literally decades of continually choosing to breed together the smallest of the small rabbits to concentrate the genes and modifying factors for “tiny” into rabbits that became tinier and tinier. There was a time during this process that the white Polish rabbit breed in England became frightfully inbred - a sickly, irritable rabbit that fled to the back of its hutch when people approached. Selective breeding must be handled with care! Don’t lose desirable traits like health and attitude in a mad rush toward a primary goal. This 17 pound Flemish Giant is not done growing yet. There is another side to the size genetics coin. Suppose you want large rabbits? If you breed the largest animals to the largest animals, it is very possible to eventually achieve giant rabbits. You’ll of course start with a large breed if you wish to go large, which is why Continental Giants began as Flemish Giants. But while the Flemish Giants tend to weigh 13 – 25 pounds (13 pounds is the smallest, and no limit to ‘large’ in this breed), it is not unusual for a Conti to weigh 30 pounds or more, despite having a similar minimum size. The largest Continental Giants have tipped the scale at over 40 pounds (18.2 kg). Talk about huge! Selective breeding made the difference; British breeders are rewarded for size, while for USA breeders, balance is rewarded before size. 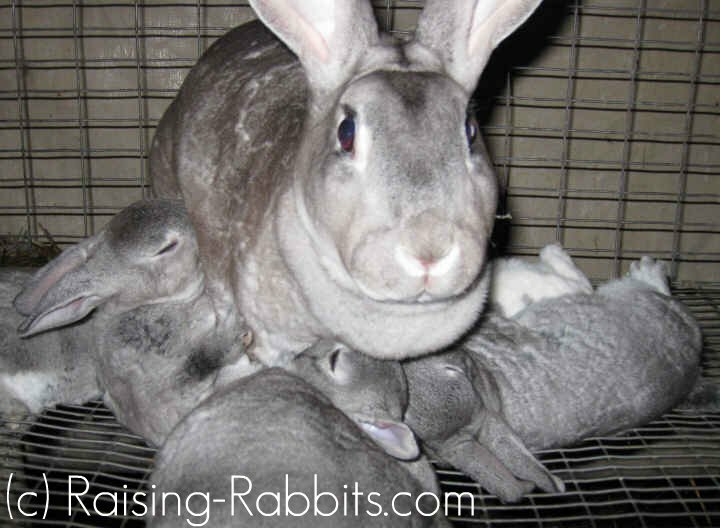 Are you raising meat rabbits for a living? Then size, commercial type and bone structure will be important factors in your breeding program. But since you depend on your rabbits for your livelihood, your does’ performance will also become critically important. This excellent chinchilla Rex doe has plenty of milk for all her kits and is willing to let them nurse beyond weaning age. Holly kindles 10-12 kits with every litter. She loses an average of 0.33 kits per litter to stillbirth, and she tends to raise nearly all her kits to weaning. At 8 weeks, Holly’s kits are 4.75 pounds each. Molly’s average litter size is 5. She loses an average of 0.82 kits to stillbirth, and another 0.5 kits to starvation by day 21. In fact, in her last litter, she kindled 5 kits. One was stillborn, one starved to death, and at three weeks old, the remaining three kits were still thin, but fattened quickly once they had access to the doe’s rabbit pellets. At 8 weeks of age, Molly’s kits typically weigh only 4 lb and take another 1.5 weeks to reach market age. Am I right that you’ll keep a replacement doe or two out of Holly’s litter, but not Molly’s? Why? Because Holly efficiently produces more kits and can feed them all with far fewer losses. With mothering and lactation being somewhat heritable, and since it costs just as much money to feed either doe, why would you even think of keeping replacements from Molly? By selecting Holly’s genetics, and the genetics of each of your does with similar performance, you begin to enhance the performance of your entire herd. As a result, over time most of your does will kindle 10-12 kits and have the capacity to produce sufficient milk for all of them. Look at all those colors in this litter! I could select FOR, or select AGAINST, the genes that produce the wanted, or unwanted, colors in my rabbits' bloodlines. There’s nothing actually magical about selective breeding, but it does work miracles when managed correctly. Enjoy the fruits of your own selective breeding!